When Arne Johanson retired from project managing large software installations, he had two goals: get away from the keyboard and be around kids. He has met both of those goals in the Greater Rancho Bernardo open spaces. That one man could do so much: it is staggering! Arne Johanson is one of my heroes. For years he has been doing incredibly important work with very little fanfare. 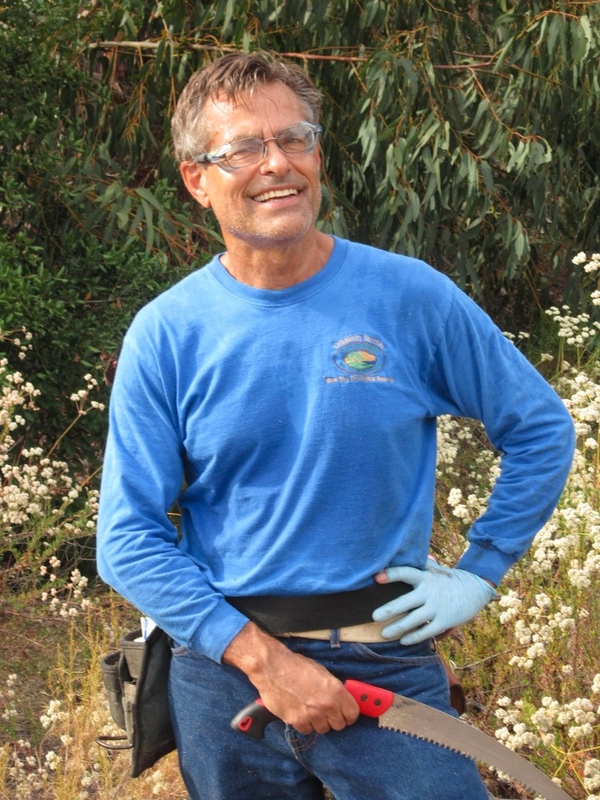 Arne is so modest, in fact, that few know of the significant contributions he is making to the health of our local ecology. Fire prevention is the number one reason I give people for using native plants in open space. For a garden it can be similar. The advantage of some native plants is that they retain moisture. The state fire consortium at UC Riverside has shown that retained plant moisture is the best indicator of fire resistance in vegetation. There are caveats. Ice plant has succulent leaf structures. However, the green growth overrides dead material which acts as a fuse when ignited by embers. Many other ground covers help spread fire, such as ivy or Myoporum. Many palms are little more than torches in wildfire conditions (fire safer exceptions are the self shedding palms with smooth trunks like the King Palm). Confers native or non-native are considered fire risks. Blue Gum and Red Gum Eucalyptus are considered fire risks at all times. Acacia pose a fire risk from dry leaves and dead twigs. The growth habit results in a fire ladder. Any vegetation should be kept away from buildings. All vegetation should be spaced in such a way that fire will not spread. While some native species are relatively fire-safe, some should be avoided. Buckwheat and sage brush are examples of plants with small leaves that are easily ignited. Lemonade Berry and Sugar Bush are examples of particularly fire resistant plants with thick leathery leaves. This entry was posted in Best Practices and tagged fire, weeds. Bookmark the permalink.